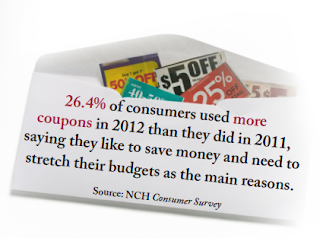 COUPONPAQ Blog: Digital Coupon Distribution Going Strong. Digital Coupon Distribution Going Strong. Over 168 billion CPG coupons were distributed in the US in the the first half of 2013-- according to recent NCH market findings-- a 1.8% volume increase from 2012 driven by FSI and Digital coupons. The coupon distribution industry remains untouched by the recent rise and fall in daily deal sites, which focused mainly on broad non-targeted consumer wants instead of needs and eventually turned customers and inherently advertisers away. According to a 2012 NCH survey, despite an increase in consumer confidence, consumers still want to save money post recession and need to stretch their budgets. and Influence Survey, December 2012. Advertisers are capitalizing on this knowledge and investing more in coupon distribution while leveraging new digital technologies to bring more customers to the door. This is exciting news for us here at couponpaq.com, because our multi-channel COUPONPAQ platform is built to manage and simplify coupon distribution for media and marketing companies in our ever changing digital world. 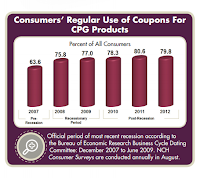 With the first version released in NY in 2001 and a new version expected early next year, companies who choose COUPONPAQ will benefit from our experience, stability and dedication to increasing the ROI per coupon generated with strategic personalized coupon targeting that drives response.